Exprolink, a product management company, is dedicated to offering specialized equipment, spare parts and service in four distinct markets, namely Outdoor Cleaning, Material Handling, Water Filtration and Anaerobic Digestion & Biogas Refining. A well-established network of distributors and agents support Exprolink assuring local presence in its various markets. Our 2 main sales offices, one located in the greater Montreal area and one in the South West of USA, distribute and support all the specialized equipment it brings to the market. Exprolink operates out of a 25,000 sf parts depot operations that can ship spare parts within 48 hours worldwide. Exprolink acquired the Madvac line of products in 2011, but most importantly, brought the seasoned staff on board with well over 50 years of experience in the vacuum litter collection market. Sales, the dealer network and target areas have since grown steadily, transforming the Madvac line into a truly global player. The offering remains focused and true, from our smallest pick-up truck box “slide in unit” the LP61, to the self contained LS100 with air-conditioned operator’s cab, hydraulically dumped hopper, industry leading dust suppression and brushes. Four units fill the mid-range spectrum of the line, the PS300, LN/LR50 series unit as well as the LR100. 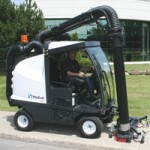 Madvac is unique in robotic boom control eliminating operator fatigue and extending the reach for optimum litter collection.